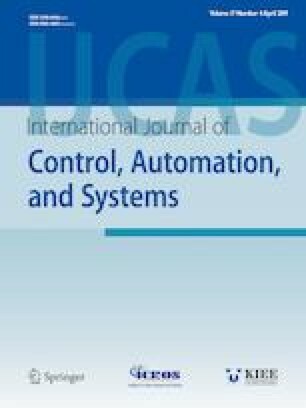 This paper discusses a particle swarm optimization (PSO)-based motion-planning algorithm in a multiple-vehicle system that minimizes the traveling time of the slowest vehicle by considering, as constraints, the radial and tangential accelerations and maximum linear velocities of all vehicles. A class of continuous-curvature curvesthree-degree Bezier curvesis selected as the basic shape of the vehicle trajectories to minimize the number of parameters required to express them mathematically. In addition, velocity profile generation using the local minimum of the radial-accelerated linear velocity profile, which reduces the calculation effort, is introduced. A new PSO-based search algorithm, called “particle-group-based PSO,” is introduced to find the best combination of trajectories that minimizes the traveling time of the slowest vehicle. A particle group is designed to wrap a set of particles representing each vehicle. The first and last two control points characterizing a curve are used as the state vector of a particle. Simulation results demonstrating the performance of the proposed method are presented. The main advantage of the proposed method is its minimization of the velocity-profile-generation time, and thereby, its maximization of the search time. Recommended by Associate Editor Augie Widyotriatmo. This work was supported by the National Research Foundation of Korea under the auspices of the Ministry of Science and ICT, Republic of Korea (grant no. NRF-2017R1A2A1A17069430). Anugrah K. Pamosoaji received his B. Eng. and M. Eng. degrees in Electrical Engineering from the Institut Teknologi Bandung (ITB), Indonesia, in 2003 and 2006, respectively. He is a Ph.D. student in the School of Mechanical Engineering, Pusan National University. Recently, he is with Department of Industrial Engineering, Faculty of Industrial Technology, Universitas Atma Jaya Yogyakarta (UAJY), Indonesia. His research interests include robotics, path and trajectory planning, robotics control systems, mobile robots, and multiple-vehicle systems. Mingxu Piao received the B.S. degree in Mechanical Engineering Department from Shanghai Maritime University, China, in 2010. He is currently an integrated Master and Ph.D. student in the School of Mechanical Engineering, Pusan National University, Korea. His research interests include sliding mode control, adaptive control, robotics, port automation, and crane control. Keum-Shik Hong Please see vol. 13, no. 2, p. 425, April, 2015 of this journal.